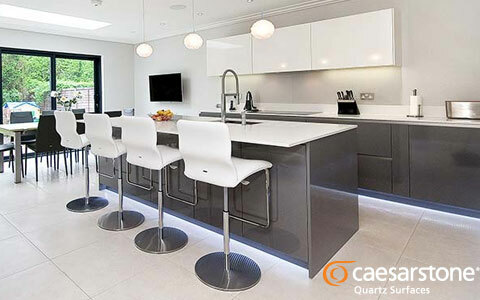 Quartz worktops are durable and have excellent scratch, stain and impact resistance. These properties together with a large design selection have made Quartz worktops one of the most popular kitchen worktop surfaces in the UK. 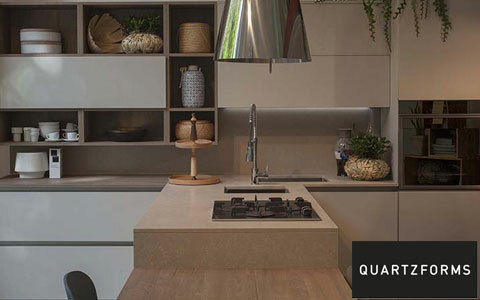 Quartz worktops have high natural content of Quartz mineral (93% and above) which is mixed together with polymer resins which keeps the natural quartz together. Naturally formed quartz is second most strongest mineral in the world after diamond. We offer large selection of Quartz worktop brands which include Silestone, Caesarstone, Radianz, Quartzforms, Compac, Okite & our in-house range. Find your desired design by browsing our collection of Quartz worktops. 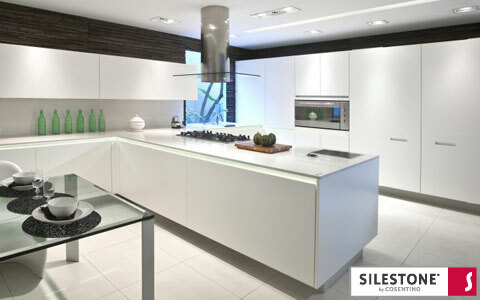 Made is Spain, Silestone is the worlds leading Quartz worktops brand with a large selection of designs & colours. Caesarstone Quartz worktops feature a Mediterranean inspired designs collection. Made in Israel. Radianz worktops feature a collection of nature inspired designs. Manufactured by Samsung out of 99% pure quartz. Quartzforms combines the best of Italian designs with German engineering. Quartzforms is manufactured in Germany. Italian manufactured Okite Quartz features the worlds first translucent quartz collection. Quartz worktops leaders in Italy. 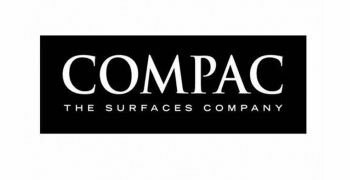 Manufactured in Spain, Compac Worktops come with an amazing 33 year warranty. Great contemporary designs collection. It’s very easy to confuse quartz with granite and vice versa. However there are few main difference between the two materials. Quartz is man made and as such, offers a more consistent design throughout the slab. Being more consistent in design joining two quartz pieces makes the joint less visible than when using Granite. Unlike granite, quartz is non-porous meaning if you spill something on to the worktop it will not be absorbed into the surface. This feature makes Quartz worktops very practical in your kitchen. 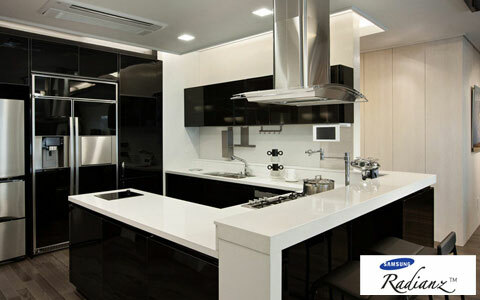 You can place hot pans on Granite worktop but its not recommended to place hot pans directly on to the Quartz worktops. Find out how quartz worktops compare to other popular worktop materials such as Granite, Corian and Laminate. Five stars is excellent and one star is poor. 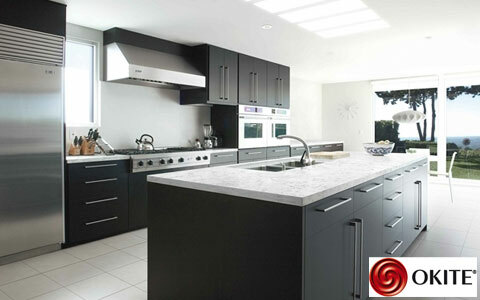 Quartz worktops are considered to be a long term investment. We will use average L-shape kitchen worktop which is 6.8 linear meters with sink & hob cutouts. The cost of this worktop using our in-house quartz range would be £1950 including VAT, templating, fabrication and installation. 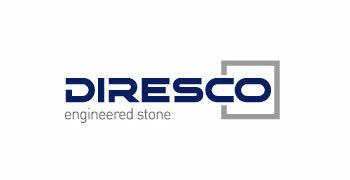 In Silestone, Caesarstone & Radianz you can expect average costs of £2950. 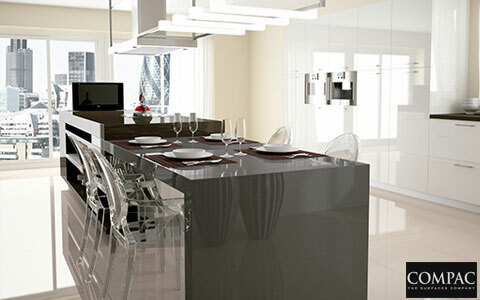 On average, it takes about 5-7 days from templating to installation of your quartz worktop surface.